Some of the earliest records available for MUDr.Josef(*1864) Vyborny (deposited now in The State Regional Archive Prague) have been searched through again and re-evaluated using special experience of K. Kysilka to complete the A) and B) items. It lasted 30 years from 1651 to 1681 (the year of the first known archive record of Frydrich). Could it be enough time for the family of the former tailor's guildmaster of Klatovy evolved to the farmer's/gardener's family - and then to the family of the field-master? Those farm masters did not belong to poor-people, this was a honest and a respectable trade. Such masters were non-subject people, usually. Re-reading recent excerpts from the registers of Bikan and of K.Hora (resulting from the study in the State Regional Archive in Jun 2001) no note have been found there as if Frydrich would be a subject-person: neither of the Jesuit estate at Malesov, nor of such of Oumonin. 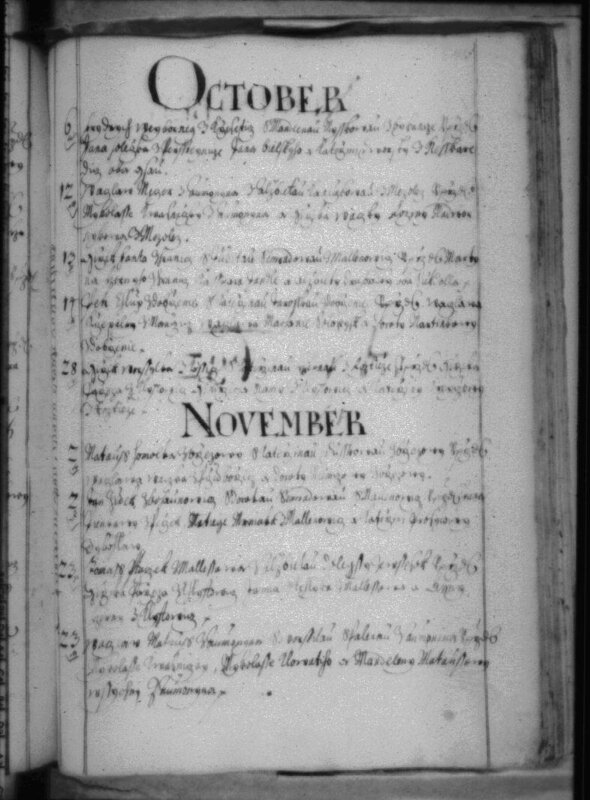 The earliest archive record - marriage of Frydrych Wegborneg (Oct 6, 1681). Detail of the record here. Frydrich married Marie Magdalena Miska in the Bikan church on Oct 6, 1681. Two interesting records exist in the register: one of 1676, the other of 1694. According to them Frydrich's bride was a daughter of Jan Miska of Bykanec, no doubt also the field-master. In 1676 a certain Jan Vasina married Anna the daughter of the late field-master of Oumonin and Jan Miska was as the witness there. Similarly we learn in 1694 the daughter of Jan Miska(!) married Lukas Vondracek of Vrbice. Witnesses of the [Frydrich's] marriage were subject-persons, however: Jan Holecek of Perstejnec, Jan Belsky and Katerina Dvorska of Neskaredice. It is of interest the surnames of both the male witnesses are registered in the list of subject-persons according the religious faith of the Kresetice estate: of Perstejnec there are listed Jan Holecek (aged 60) the carpenter with his wife Anna (aged 27) and Matej Holecek (aged 28) the farm-laborer with his wife Anna (aged 20); of Neskaredice there is listed Jakub Belsky (aged 25) a small-farmer with his wife Anna (aged 21). But contrary to this situation, when Frydrich's daughter Lidmila was born in Bylany in 1689, the god-parents belonged to the citizens of the town of Kutna Hora yet - all of them are written as Mr. - Mrs.: Mrs. Juliana Wagner, Magdalena Ludvicka and Mr.Frantisek Koudela. Sometimes later Frydrich has become "the manager of the farm" at Bikanec. The god-parents of his other children were regularly Vaclav Brzenczil of Kresetice called the field-master of Kresetice later, and Katerina, Vaclav and Anna Fialka of Kresetice and Jirik Werner of Bykanec. 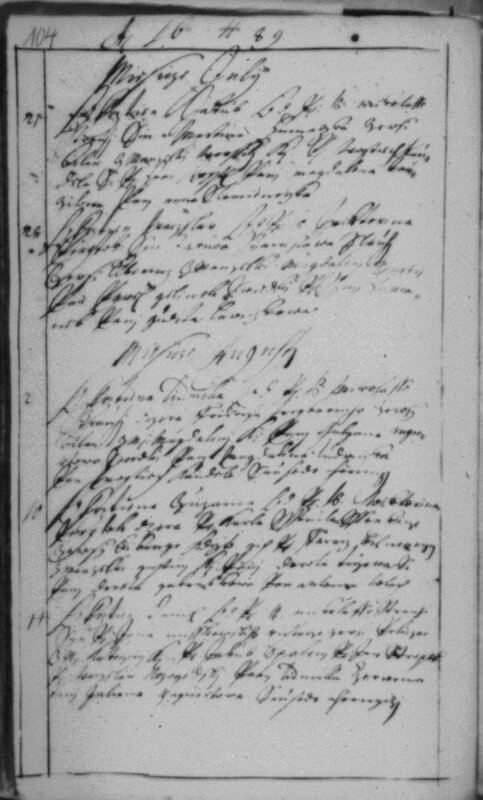 Record of birth of Frydrych's daughter Lidmila (Aug 2, 1689). The picture can be enlarged by clicking on. This Jirik Werner of Bykanec was a witness at the above mentioned marriage in 1676 together with Jan Miska. If Frydrich Wyborny was not a descendent from the family of Vaclav the garden-master of the Jesuit College of K.Hora, his origin should be looked for among these persons: field-masters, managers [stewards] of farms of the yard of Kresetice or even of those of Malesov or of Oumonin. It should be noted the estate of Malesov has had more common points with the yard of Oumonin. Malesov belonged to Berka of Duba until 1666 and then to the counts of Spork untill 1699. Tomas Popovsky of Sarfenbach was the lord's manager at Malesov. He bought the yard of Oumonin from Karel Lev of Ricany in 1661. This yard belonged to the Kutna Hora Jesuites not earlier as in 1730's. An another interesting point or a trace - as stewards both of the manor of Malesov and of the yard of Roztez there were two members of the Cerny family (Jan and Barton). The possible connection between Cerny's and Wyborny's has been mentioned earlier. Yet another Cerny family at the Kresetice estate there was Jan Cerny the carpenter (45) at Predborice with his wife Anna (25). There were no more Cerny's in this region. It would be desirable to look there for any occurence of the above-writen names.